Ethical Products, Inc. is a privately owned and managed company that was established in 1952. Our Bloomfield-owned headquarters employs approximately 50 people with a 115,000 square foot distribution center and 15,000 square foot office. Ethical Products, Inc. distributes more than 1000 SKU’s of hard and soft goods to all major pet wholesalers and retailers and exports to Europe, Mexico, South America, Canada, Mideast and the Pacific Rim countries. Ethical Products is widely known as the leader in the development and marketing of new and innovative products year after year. We have won prestigious New Product Awards at the GPE Shows in multiple categories in past years. We have received awards for best new products for dogs, cats and aquatics in our SPOT brand divisions. Our reputation for novelty products and point of purchase displays as well as the names of “SPOT” and “FASHION PET” are recognized around the world. In May 1997, Ethical Products, Inc. opened a showroom and sourcing office in Hong Kong which operates under the name of PETEX INTERNATIONAL, LTD. (Petex). Our staff designs, sources and develops products from more than 15 countries around the world and participates in all major domestic and international trade shows. We maintain our own quality control staff in the U.S. as well as in Asia, at the point of manufacture. Our strength in designing and sourcing innovative products with our own staffed offices in the United States puts us at the forefront of the pet industry. Our strategic direction and development for the future will include to encompass other office sites in Latin America and China. Our broad distribution capabilities across the European Continent will make us a true global pet manufacturer in the industry. Opened the company’s pet bed division. Opened sales office in Paris to increase European presence. Introduction of the America’s VetDogs® licensed program. Jonathan forms board of advisors. Achieved significant penetration in Europe. Licensed Purina Pet Care line. Converted Bloomfield, NJ facility to 100% solar power. Achieved significant penetration within FDM. Introduced new branding for the Spot line. Expansion into the infomercial market. Introduced the first stuffing free dog toy line to the market under the name “Skinneeez™”. Acquired the Vermont Style Chew Toys brand from Lambert Kay. EPI moved to a new 130,000 square foot facility in Bloomfield, NJ. The Petex office is established in Hong Kong. Jonathan Zelinger is named President. Jonathan Zelinger joins the company. Alan Zelinger joins the company and revamps the product line. 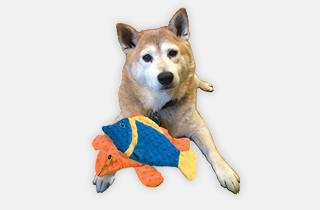 Joe Zelinger established business as an importer of pet accessories.